The Society has been able to obtain a limited amount of copies of this amazing and hard to find book. Originally published in the 1970s to commemorate the presentation of Briton Chadwick Ltd's collection to the Norfolk Museum Service in 1974. Although the book contains only 24 pages, its large format and profuse illustrations make it one of the most informative publications on brush making ever produced. 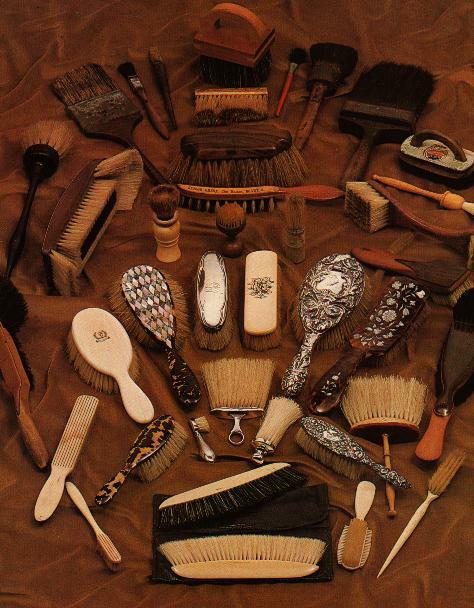 It shows pictures of brushes, very old engravings of brushmakers and brushmaking techniques. Its concise, easy to understand text explains a great deal a bout brushmaking and gives its history from ancient times to the 1970s. It includes information on tramping and the growth of brushmaking in Norfolk. Although it is titled "A Norfolk Craft" its content applies to brushmaking everywhere! The gems of this book, however are the large transparencies of the 1839 Arms of the United Society of Brushmakers and the depiction of a Knot Picking and Punching machine being operated by a woman, circa 1890s. If you are descended from a brushmaker, or just interested in the trade, this book is likely to be the most informative and useful you will find! The copies we have on offer are as new, direct from the publishers as they were printed in the 1970s.